Founded in 2006 by entrepreneur Joe Michaels and Oxford University renewables lecturer Dr Chris Jardine, Joju Solar helped pioneer ‘democratic energy’, building some of the earliest and many of the largest community-funded solar projects. We’ve also supported the drive for solar on social housing – helping the very poorest benefit from free electricity from the sun. Adapting to the changing UK market we are now applying the community funding model to LED retrofit in schools. Based in London and Oxford, and undertaking projects across England, we’d love to discuss your project. For the last two years we have been recognised at the Solar Power Portal Awards with three nominations two years running. This year we received Highly Commended in Residential Energy Management for our first Tesla Powerwall installation. 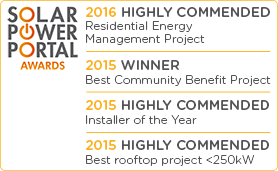 And in 2015 we won the Solar Power Portal Award for the Best Community Project for our installation at Norbar. We also received two Highly Commended awards for Rooftop Installation <250W and Installer of the Year respectively. We hope that 2017 will be even more successful. The judges were particularly impressed by the close partnership between a solar company, Joju, and a community energy organisation, Low Carbon Hub to install solar at scale on community buildings. We are always proud and happy to be recognised for the work that we do whether it’s by national award bodies like the Solar Power Portal or our local London council, Islington, who awarded us a Green Business of the Year award. We are independent experts in what we do and have accreditation for our work from several industry bodies as well as being 5* Rated on the independent government review site YouGen.co.uk. Joe has a commercial and entrepreneurial background. 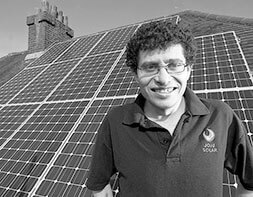 In 2006 Joe set up Joju Solar because he was determined to use his experience and skills to be part of the new Green Economy and play a real part in tackling climate change. 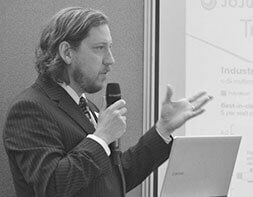 Dr Christian Jardine is a founder member of Joju Solar and has been involved with solar PV since 2001 when he ran Oxford University's research into solar energy and microgeneration.